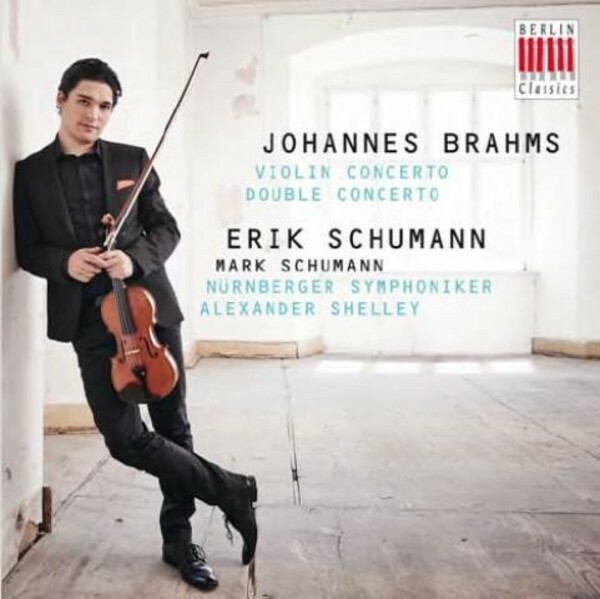 This first CD by charismatic young violinist Erik Schumann on the Berlin Classics label is an inspiration: together with brother Mark and the N�rnberg Symphony Orchestra under the baton of Alexander Shelley, Erik plays the Violin Concerto and Double Concerto by Johannes Brahms. The lean string section reflects the orchestra of Brahms' day, giving a natural, lucid sound image of the Brahms concertos. Erik Schumann plays the Violin Concerto with full, rich tone, bringing out the work's songful and emotional side. The harmony between the two instruments in the Double Concerto epitomizes the close relationship between the Schumann brothers. Brahms is not staging a contest here but a collaborative act of creation. That makes the work ideal for the two brothers, who also make chamber music together. Erik Schumann has already captured the imagination of an international audience with his appearances alongside leading orchestras. With his brothers Ken and Mark and Liisa Randalu he represents the Schumann Quartett, which notably won first prize in the 2013 International String Quartet Competition in Bordeaux. Erik Schumann's debut CD, on which he played sonatas by Sergey Prokofiev with Henri Sigfridsson, was warmly praised by the press. Why a recording of Brahms, then? Erik Schumann explains that Brahms is very close to him - he is fascinated by the precise way Brahms applies his concept of form and structure to the composition and by the almost superhuman warmth that is generated. "The nicest thing that can happen is that everyone yields to this music. Gives in and simply enjoys its greatness. That is wonderful."